"This will be a big change for me here in Amarillo," he said. "The song, 'Amarillo By Morning,' will have new meaning for me." He said he is looking forward to meeting people and settling into his new position and home. "I do come with no agenda," he said. "I don't know the diocese. You don't know me, and I don't know you." Zurek told the gathering that God must have a sense of humor, as this is the second time he had been assigned to a post just before Christmas, but required to keep the news secret until after the holidays. He said it was really hard at Christmas to be home with all his family and not being able to say anything. "I love working with my priests, deacons, religious men and women and lay leaders who are the core of the church," he said. Zurek speaks five languages and slipped fluently between English and Spanish while introducing himself. Bishop Thomas Flanagan,who was named with Zurek in 1998, retired in December 2005. Retired auxiliary bishop Bernard Popp turned 90 last month and is recovering from knee surgery. 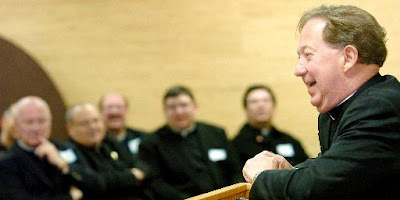 Age and infirmity have limited their availability and that of [Archbishop-emeritus Patrick] Flores to officiate at confirmation liturgies in the next few months, and Zurek now will have to tend to his new flock in Amarillo. Deacon Pat Rodgers, director of communication for the archdiocese, said [Archbishop Jose] Gomez expects an announcement soon on a successor to Flanagan, which he had requested long before learning of Zurek's pending promotion. "This leaves Archbishop Gomez with quite a task ahead," Rogers said. "Even with three bishops available, the schedule keeps them all very busy. Now he won't have much help." While a good bit of attention has been devoted to the lengthening searches for diocesan bishops -- a time-frame which has more than doubled in recent years, currently averaging 18 to 24-months from start to finish -- US dioceses keeping vigil for an auxiliary or two have been waiting even longer. For example, last week marked three years since the elevation of Gomez, then auxiliary of Denver, to the San Antonio post. Though Archbishop Charles Chaput started the process for Gomez's replacement in the Rockies within weeks, the wait continues. Across Texas, Cardinal Daniel DiNardo of Galveston-Houston has but one active auxiliary, Bishop Joe Vasquez, aiding him at the helm of its 1.5 million Catholics. With DiNardo's recent elevation to the College of Cardinals forcing a sudden rework of his schedule to reflect the wider commitments that come with the red hat, the word's gone out that some confirmations might have to be taken by priests in the Southwest's quickly-expanding hub. And along the coasts, the prospect of months, even years, of waiting led both Archbishop Donald Wuerl of Washington and Bishop Tod Brown of Orange to start taking soundings almot immediately after each lost an auxiliary to a diocesan appointment. As with appointments to diocesan bishoprics, it would appear that three factors have contributed to the backlog: intensified research of candidates' backgrounds, a talent pool viewed as thin by the process' key players, and the increased instances of nominees who, informed of their selection, have declined appointment. While years past saw upwards of 15 to 20 auxiliaries named in a given year to the larger Stateside dioceses, 2007 boasted the appointment of but three new assistant bishops: Shelton Fabre in New Orleans, Peter Libasci of Rockville Centre and Bill Callahan OFM Conv. in Milwaukee. Signs are popping up that the pressure on the heaviest appointment docket in the US church's recent history is beginning to ease. But, sizing up the waiting periods, some ordinaries are averse to even try their hand at getting help. "I've thought about asking," the head of one large flock recently mused. "We've had [auxiliaries] before and I could use one immensely." However, "I just don't want to do all that [paper]work to find myself with the Lord before the appointment finally comes." For the record, the prelate quoted is in good health.